Moisturising and toning, ensuring that your skin always mantains enough water in its various levels; smoothing and minimising the signs of time; making skin more compact and firm, assisting the physiological production of Collagen. 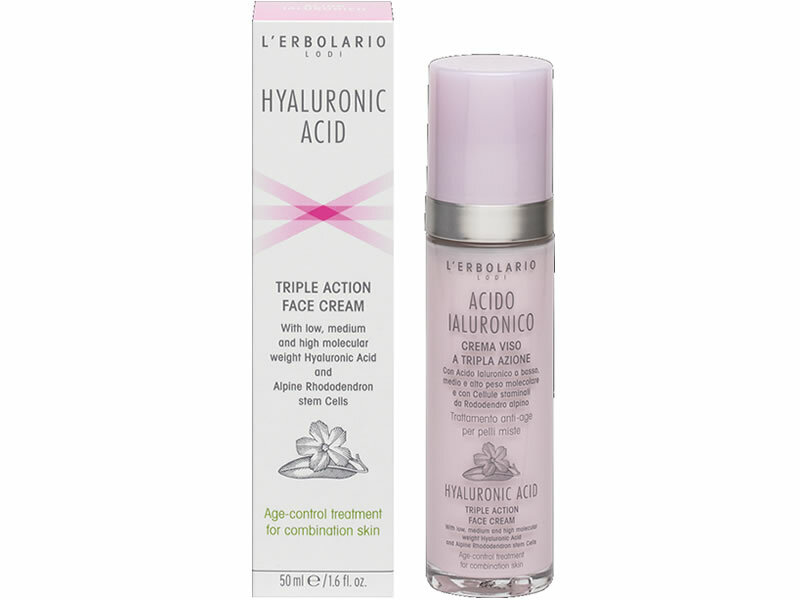 These are the primary functions of Hyaluronic Acid in the highly pleasant texture of this cream, with a formula that is also enriched by Alpine Rhododendron stem cells, which “teach” your skin to tolerate environmental stress, and Epilobium extract, which is an excellent normalising and skin-purifying ingredient. Cleared from shiny patches and unpleasant oily traces, day after day, the skin of your face will become softer and smoother, fresh and intensely moisturized. Apply a dollop of product to well-cleansed skin on the face, neck and low neck line. Low, medium and high molecular weight Hyaluronic Acid, stem Cells from Alpine Rhododendron leaves,Extract of Epilobium, Babassu Oil, unsaponifiable Fraction of Olive Oil, Vitamin E from Soybean, essential Oil of Ylang Ylang flowers.